Last year, I reviewed a product for a marketplace that has since closed. So I wanted to share my thoughts about these books with you here because this set of books has become an invaluable tool for us in our homeschool. In fact, I would say that they are a must-have for ANY middle schooler's home reference library. It's not just for homeschoolers. All kids (and their parents, too!) will love this series which helps describe the most important concepts in all subjects in a clear and concise manner. 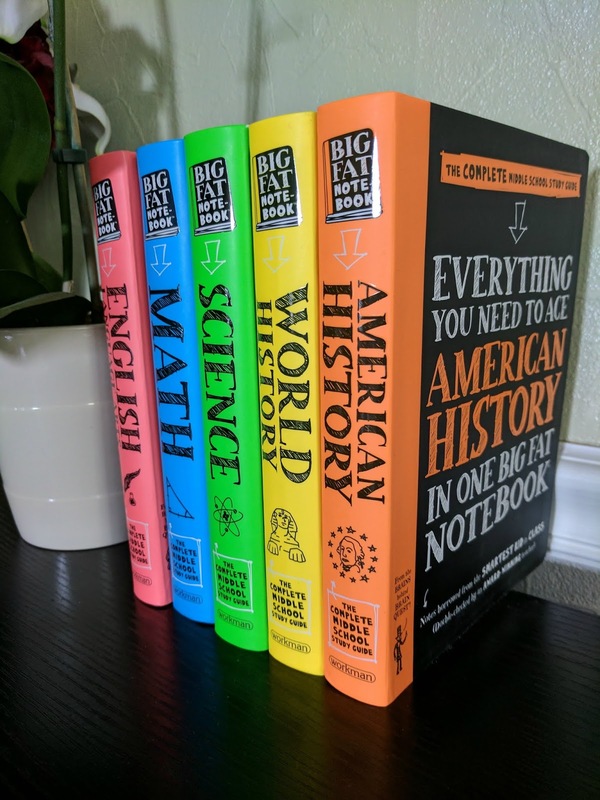 The Big Fat Notebooks series is set of five books covering all the major subjects in middle school in easy-to-understand detail. They are your middle schooler’s new BFF! The best thing about this series is that it is very reader-friendly and presents the information in an engaging manner with lots of visuals to help your student understand and retain the concepts. Children in traditional schools can use the series to help them complete homework, while homeschoolers can use the books as a curriculum spine, or the base curriculum for your entire school year. The books were created by the same people behind the popular series, Brain Quest. We’ve used their workbooks regularly in our homeschool as a supplement to our lesson or for days when we just need a change from our main curriculum. But the Brain Quest series only goes through 6th grade. 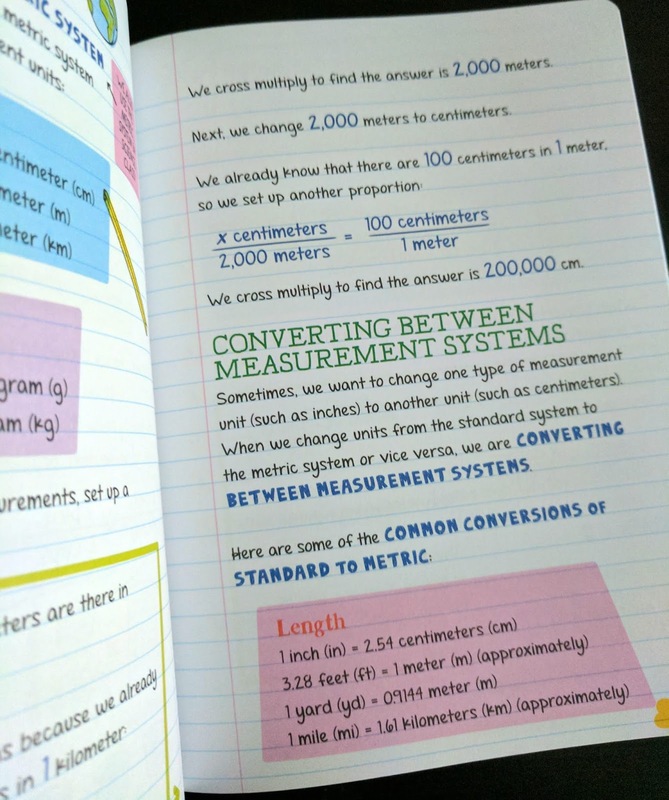 Enter the new "COMPLETE Middle School Study Guides.” They are very different from the workbook sets. There is a greater emphasis on layout and the use of colors. We love how these books break up concepts into short manageable sections that focus on the key concept being taught. 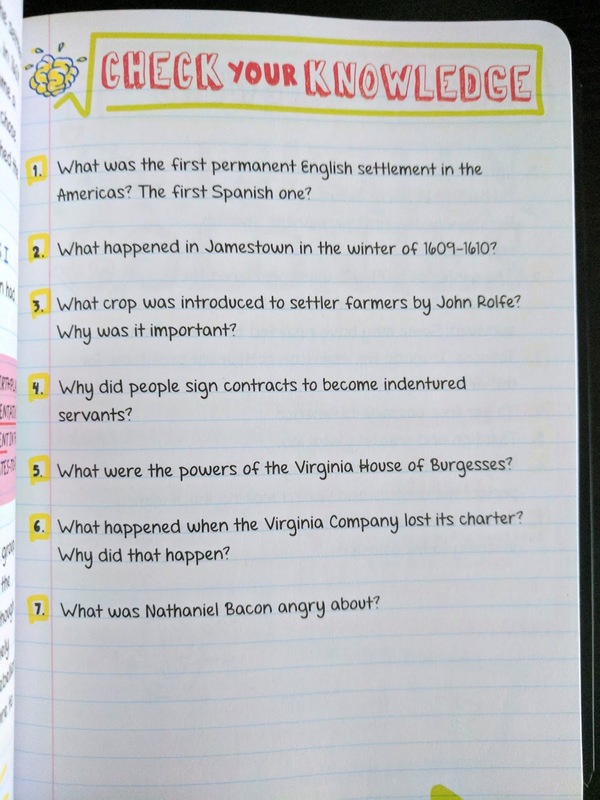 The front of the book states that these are “notes borrowed from the SMARTEST KID in class” and the information is definitely arranged in the form of a notebook, with highlights in different colors representing different things (i.e., yellow highlights = important vocabulary, green highlights = definitions, and blue writing = important people, places, dates, and terms). The illustrations are more like doodles that help the note taker to visualize big ideas. The only thing that would make this series better is if they had included an index at the back for easy reference. For instance, my daughter was trying to look up subordinating conjunctions, but they weren’t listed in the Table of Contents because they were included in the chapter with phrases and clauses. So it took a little while to find them. From intensive pronouns and figurative language to setting and tone to plagiarism and citation, your child will learn about these concepts in easy-to-understand language with simple examples. 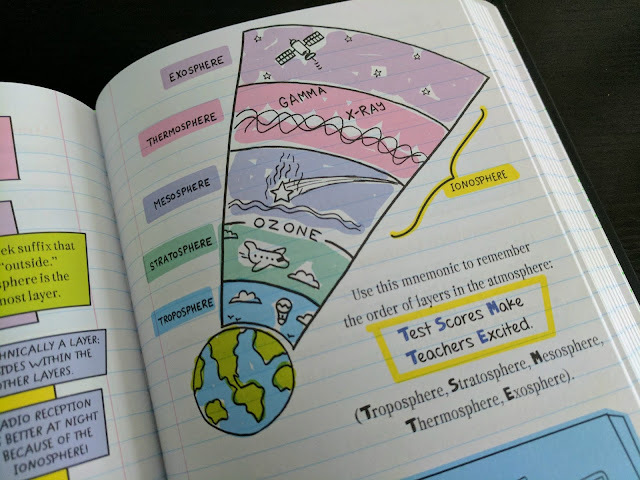 There are definitions, diagrams, doodles, and even mnemonic devices to help your student remember important information. This book is really a goldmine not just for students, but for the parents to whom they turn asking for help! Can’t remember how to convert measurements or calculate simple interest? No problem! You can just look it up in this handy notebook! This book is my favorite of the set! It covers so much information and I’ve enjoyed just starting at the beginning and taking each section one by one with my kids. Sure they can use it to supplement their science curriculum, but this book is also fun to use as a science spine. Take it one section at a time and then supplement it with activities, books, and experiments! The doodles are simple but very entertaining, and the explanations are clear and concise. If you could only get one book of the whole series, this would be it! I think this book is great for explaining the more difficult events in American history, such as the cause behind World War I. I love how superfluous details are left out and the main points are the focus of these books because it really helps to clarify those murky moments in U.S. history. From the Louisiana Purchase to Burr vs. Hamilton to D-Day, this book is a super helpful guide for students studying American history. And finally, we have world history. From Medieval Japan to the Olympic Games, this book covers tons of information in bite-sized snippets that focus on the key points. Overall, I love how these books strengthen a student’s skills for using a reference source. It also empowers them to find the answers they are looking for rather than asking an adult or looking it up on the internet. Actually, it is better! Have you ever looked up the reason for World War I on the internet? Or how to find the least common multiple of two numbers? We like the descriptions in these books best. For homeschoolers, this isn’t a stand-alone curriculum. It must be supplemented with textbooks or living books and online tools, if you choose to use it as a curriculum spine. The Powerful You - ¡Tú El Poderoso!